While many people think life jackets are only for children or weak swimmers, the truth is that everyone should wear one. Obviously children should wear life jackets because even if they are good swimmers, it’s easy for them to get fatigued or swept under by currents or fast moving waters. It’s also against the law in some states for children under a certain age to be near the water without a life vest. As far as adults or good swimmers are concerned, it’s always best to be safe than sorry. If you are thrown out of a moving boat then it may take some time before the other boaters notice that you are missing . This means you could be stuck treading water for extended amounts of time until you are rescued. If rough tides, undercurrents, rip tides, or strong currents are present then it can be difficult to stay above water regardless of how great of a swimmer you are. Life jackets are invaluable because they can keep your head above water no matter how strong the currents are. Also, a lot of states are now making it mandatory for adults to wear life jackets during specific water activities (white water rafting, canoeing in certain areas, deep-sea fishing, and more). We realize that it can be difficult to pick a life jacket that will not only keep your head above water, but also be comfortable. For this reason we have provided you with reviews of three of the best life jackets for sale. No matter which one you decide to buy, you can rest assured knowing that you’re getting a quality vest. 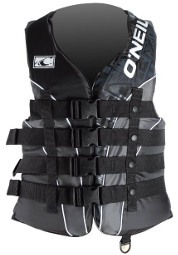 If you want to look stylish while being safe, then the O’Neill Superlite USCG Vest is perfect for you. O’Neill is a popular brand that manufactures surf styled clothing, backpacks, towels, boards, and more so it’s no surprise that they have their own water vest. The vest is available in a multitude of colors including black with gunmetal, black with red, metal with red and black, black with metal and black, and navy and coal. So clearly there’s a color combination for anyone. Colors aside, this vest is Coast Guard approved and features a coated polyester shell with four attractive chest straps with quick release buckles. It also includes a closed cell PVC marine foam that provides you with optimal buoyancy while minimizing the bulkiness associated with many vests. The advantage of this vest is definitely the comfort factor. If you have to pick one vest to be stranded in the open ocean with, then this is the one to choose. It provides maximum comfort with maximum flotation keeping you in the perfect reclining position with your head above water while also allowing you free range of swimming movement should you need to swim backwards or forwards. Because of this, we also recommend it for water sports such as skiing or rowing where arm movement is required . When compared to other brands, O’Neill offers a great value as it provides you with comfort, style, brand name, and buoyancy at a reasonable price. This vest is composed of durable nylon with three buckles across the front, open sides, and is Coast Guard approved. 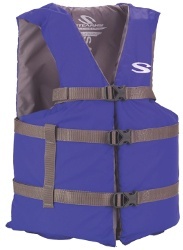 You can pick between red and blue, regular or over-sized when ordering the Stearns General Purpose Life Vest. The bright colors of the vest mean that you can get spotted sooner if you are in trouble and it also means that while you are enjoying your day in the water, jet skis and other watercraft can easily see you to avoid slamming into you. The jacket is also relatively comfortable considering its price and it provides great buoyancy. However it can be uncomfortable if you are trying to swim on your back because the vest rides up and sits awkwardly under your arms. This makes it a little difficult to row backwards with your arm, although it will keep your head above water during even the roughest currents. This is because of its standard “reclining with your head up” proper position when resting in the water which is desirable when it comes to purchasing life jackets. Another added benefit to this product is that it allows free range of motion with your arms while kayaking. Many life jackets are bulky and tend to ride up when out of the water meaning that they sit right under your arms constricting your movement. This vest doesn’t. It allows you to comfortably row without chaffing or getting in the way. With an affordable price tag, there’s a reason this product is a #1 best seller. While at first glance this vest looks simple, especially when compared to the first two, the ONYX General Purpose Boating Vest is still a great product. Available in red with navy, red with black, and blue, this vest is also United States Coast Guard approved. It features three belts that sit across your chest and while they may not be the most visually appealing, they feature quick release buckles which is great should you need to get out of the vest quickly and easily. It also features a denier nylon fabric on the outside and PE foam construction making it lightweight but incredibly buoyant which is perfect for people who are looking for a “barely-there” fit vest. The only downside to this product is that it does tend to run small, so keep that in mind when purchasing. That aside, the life jacket does its job. It’s great for boating, skiing, kayaking, and floating around the water as it allows full range of motion with your arms. 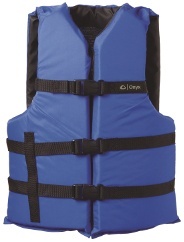 While the vest does ride up some when in the water, it still maintains the required reclined floating position with head above water so there is no need to worry about an undercurrent pulling you under. One of the best features of this vest is how light-weight and comfortable it really is. Many vests tend to be bulky, heavy, and regardless of how “stylish” it is, you still know you’re wearing a life vest. With this one, you tend to forget that you even have it on. This means you can focus less on the bulk on your chest and more on fishing and other fun water activities. This is also the most affordable model on our list.